Greetings fans of Dine Delish! Thank you for all the support and for reading by blog, tweets, Instagrams, etc. I want to wish everyone a Merry Christmas and a blessed New Year. I don’t know what 2014 has in store for me, but I am excited nonetheless. I pray for more delicious food, which will lead to more blog posts! Please enjoy this time with friends, family, and loved ones. Hug your children, parents, and loved ones, eat together, and just enjoy each other’s company. Lotus of Siam is a bit off the strip, and sits in a sketchy area. There is nothing special about this place, inside and out. After reading so much about it, and hearing Andrew Zimmern rave about this place, it was on top of my list for my last Vegas trip. It goes to show, all of the top restaurants aren’t inside the popular casinos and resorts. Most of them are all commercialized and owned by restaurant groups. 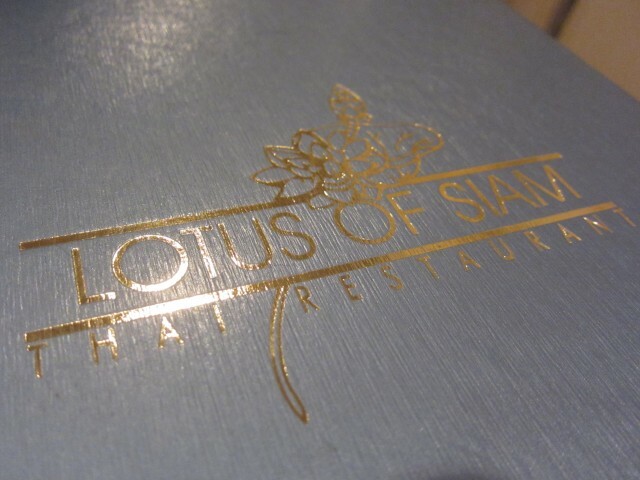 Lotus of Siam is one of one. It makes it unique and special, and is a part of Vegas as much as any of the popular resorts. 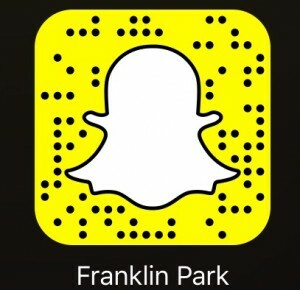 We started things off with something exciting and new. 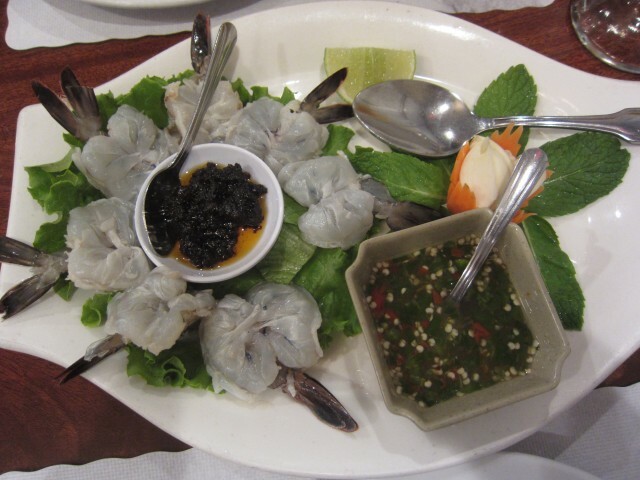 The Koong char num plar, raw prawns marinated in seasoned fish sauce was a favorite of ours. With the spicy fish sauce, fresh garlic and roasted chili paste, the dish definitely had flavor. Ironically, I used a bunch of that fish sauce to get rid of the rawness and “fishy” flavor. Spiciness met sweetness from the shrimp. The texture of this was spectacular. A bit on the sticky side, the texture took some getting used to. Still a great way to start. My personal favorite was the Nam Kao Tod. 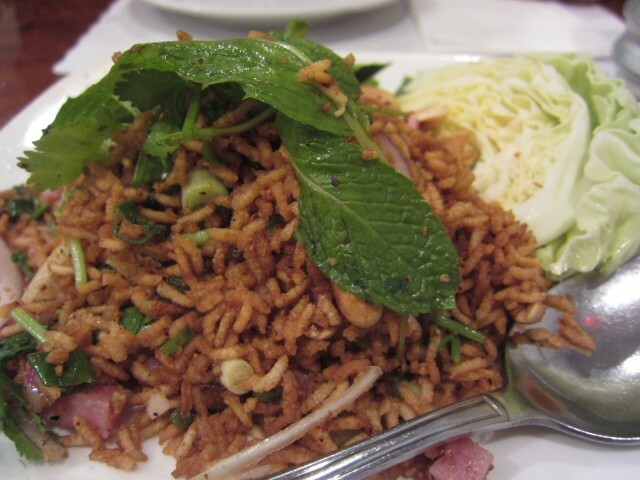 It was a crispy rice mixed with minced sour sausage, green onion, fresh chili, ginger, peanuts, and lime juice. Texturally different from the raw shrimp, this had a nice crunch, and the crunch played a great role in this dish. The ginger flavor popped and the citrus was key. It was delicious and refreshing. The dish of all dishes–the one to get here always Is the Drunken Noodle Prawn. 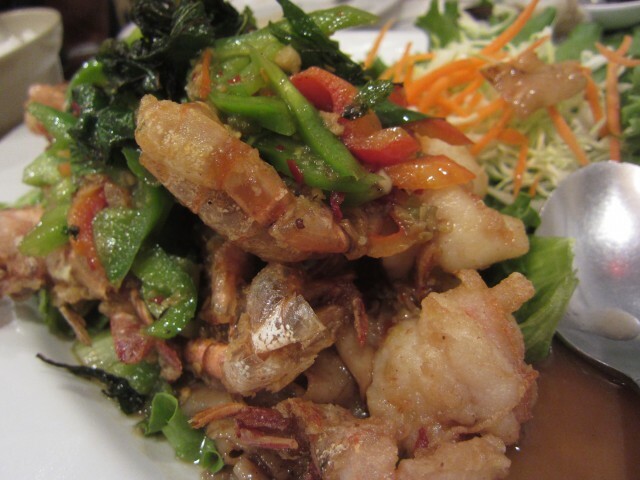 Thick rice noodles are on fried with deep fried prawns. The shell I kept on and the frying process makes the skins edible. The special blend of garlic sauce and Thai basil was perfect. The prawns were cooked perfectly and the crunch of the skin was amazing. This dish is pretty hard to pass up — a definite must order here. 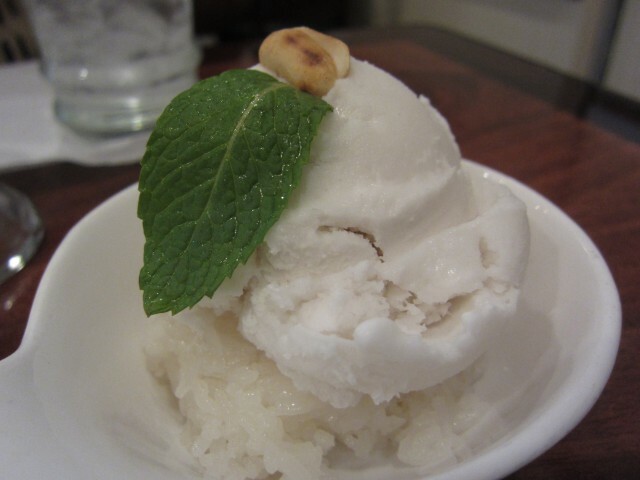 To end everything, we ordered the coconut ice cream with sticky rice. It was a great neutralizer form all that garlic, shrimp, and spices. The coconut flavor was mild and not too overpowering. My favorite was the sticky rice. Everything just had such a delicate flavor and nothing was overbearing. 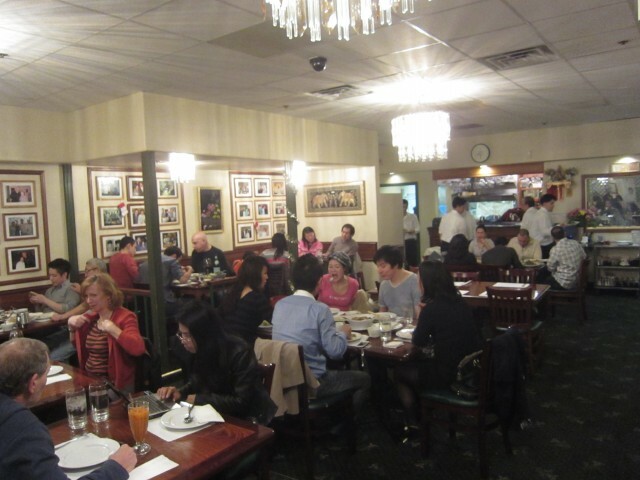 Back home in Los Angeles, there are a bunch of Ktown style Chinese restaurants that have pretty good food. From spicy seafood noodles to fried pork and beef dishes, they are all delicious, but you won’t find any of these in China. The menu hasn’t changed ever since the first time I went, and that is the quality of the places. You know what you will get, and its the same no matter when you go. Lotus of Siam is kind of like that. The menu hasn’t changed in forever, and the food, though may not be genuine Thai renditions is delicious. I was at Huntington Beach the other days, before it was cold cold. I had wanted to try 25 degrees in the Roosevelt Hotel in Hollywood for a while now. 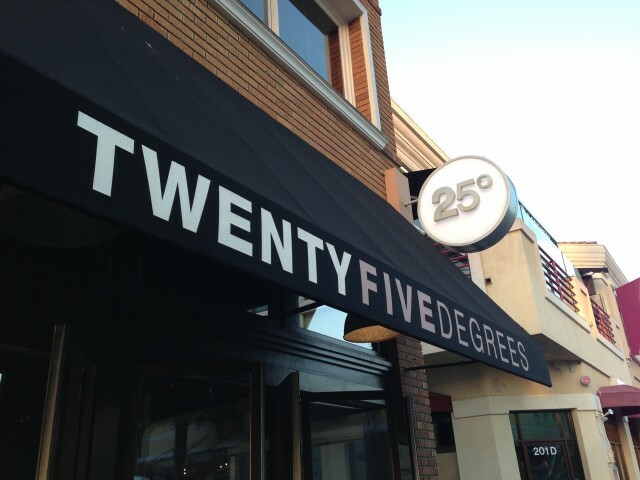 On my stroll around Huntington Beach, I was pleasantly surprised to see it in Orange County! I orders the number three – it had mezzo secco, jack cheese, green chile, chipotle, and avocado. All that was missing was bacon. Honestly though, even with the salty holy grail of all burger toppers missing, this burger didn’t need it. The flavor of the beef was so pure and clean. Juices dripped from all corner of this burger. All this time, bacon burger were masking the pure taste of beef. The avocado and cheeses made somewhat of a mash of guacamole and each bite just dissolved in my mouth. Score! On the side of the burger was an order of onion rings and sweet potato fries. These were also quite good and I had no complaints. 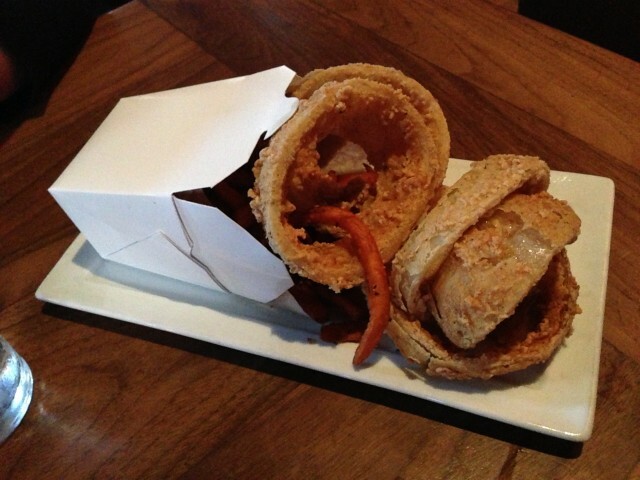 The onion rings had a great crunch on the outside –the batter was perfectly light. The sweet potato fries were a little soggy, as almost all mostly are, but still had a great crisp left in them. These two were a great match with the burger. 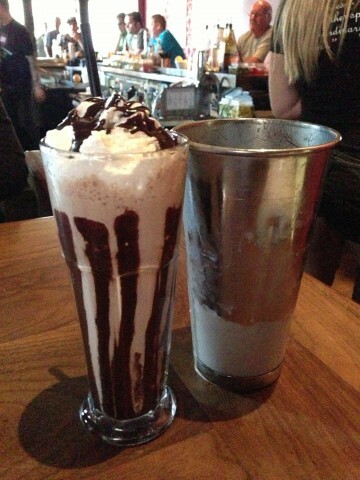 For dessert, we order the Guinness shake. I was intrigued and where else can you order such a thing? This shake isn’t a Guinness “taste-alike” kind of drink. It straight up had a lot of Guinness beer in it. They did ask for ID after all. The creamy, chocolaty goodness mixed with Guinness was genius. It worked so well and the flavor was complex with that beer added in. This is a must order when you are here. The decor inside and out was classic. 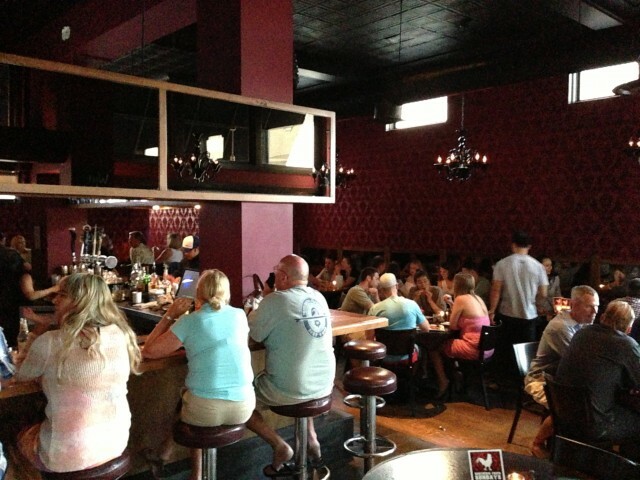 Adopting cues from the Roosevelt Hotel in Hollywood, the center that took over the majority of the restaurant. I didn’t have my point and shoot or my DSLR, so my iPhone camera had to endure the low light situation. 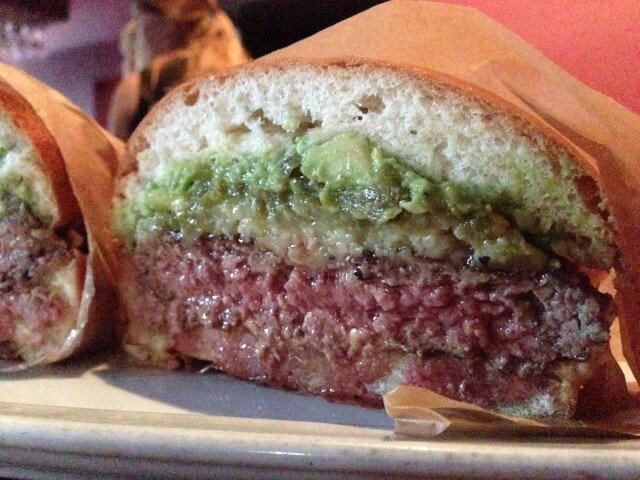 Though the pictures came out subpar, the burgers are a different story.